I went to see The Invisible Woman with high hopes for an exciting period drama: beautiful cinematography, elegant costuming, and all the literary sensibility and gravitas that Ralph Fiennes can muster. I meant to indulge a weakness for the historical film genre with its ridiculous love affairs and well-dressed women; never mind the obvious clichés in silent muses, middle-aged men leaving their wives for younger women, or highly intelligent maidens coming to no good end in nineteenth-century Europe. I left the cinema feeling rather perplexed, and I can only conclude that it had something to do with the very clichés I’d meant to gleefully ignore. Adapted from Claire Tomalin’s eponymous biography of Ellen Lawless Ternan (1839-1914), the film tells the story of Charles Dickens (played by Fiennes) and the actress who became his mistress in 1857 (played by Felicity Jones). “Nelly,” as she is affectionately called, was eighteen when she met the novelist, playwright and poet on the set of The Frozen Deep, a play written by Dickens and his friend Wilkie Collins. At the time Dickens was forty-five, married, and the father of ten children. The youngest in a family of players, including her mother (played by Kristen Scott Thomas) and two elder sisters, Nelly is the least talented among them. As her mother puts it, “Nelly’s talents lie elsewhere.” In fact, she is a voracious reader of novels and a passionate lover of Dickens’s fiction, not to mention thoughtful, eloquent, beautiful, and charming. Though the Ternan ladies are glamorous and sought after, we are given to understand through hushed conversation, and by way of sagging chairs and decadent panelling, that life as an actress is precarious. Mrs. Ternan is especially anxious for Nelly’s future, and to a large extent, this fact alone motivates the plot. This production—Mr. Fiennes’s second feature as director—is remarkably concerned with the fate of women. The cares of the widowed Mrs. Ternan, a hard-working mother, coalesce with a number of troubled feminine portraits. There is Dickens’s wife, Catherine (Joanna Scanlan), doubtless burdened by the aftermath of ten pregnancies and forced to endure public humiliation and private cruelty. There is Wilkie Collins’s mistress, whose brief appearances highlight her rebellion against convention. In a scene the purpose of which can only be to aggravate the tension surrounding Nelly’s prospects, Dickens is horrified to encounter a young prostitute in the bowels of the city. In the sequence that follows, together with the Ternans, he raises money to support the city’s hospital for wayward women and their children. And this brings us to Nelly herself. Although she is initially quite taken with the charismatic author, her impression of the man himself seems to sour rather quickly. Following her mother’s advice, she consents to a clandestine relationship and a life in shadows—however reluctantly. But the director leaves the question of her true feelings to the eye and mind of the viewer for they are entirely unspoken. While Charles’s affection is articulated clearly, both verbally and via body language, Nelly never answers the question as to whether she loves him. In close-ups of her face, even in the tenderest of moments, her expression is, at best, ambiguous and more easily, impassive or indifferent. Except for a very brief and elusive memory of joyful companionship, shown via silent montage, she hides any authentic feelings, needs, or desires. Has necessity hardened her? Was she disgusted by her paramour’s behavior toward his wife? Did the transgression of convention shame her in her own eyes? Does she begrudge the effacement of her identity? Was she lonely? To his credit perhaps, Fiennes does not resolve these doubts. Most of the story is told via flashback from the perspective of Mrs. Nelly Wharton-Robinson, a woman very much haunted by her past. 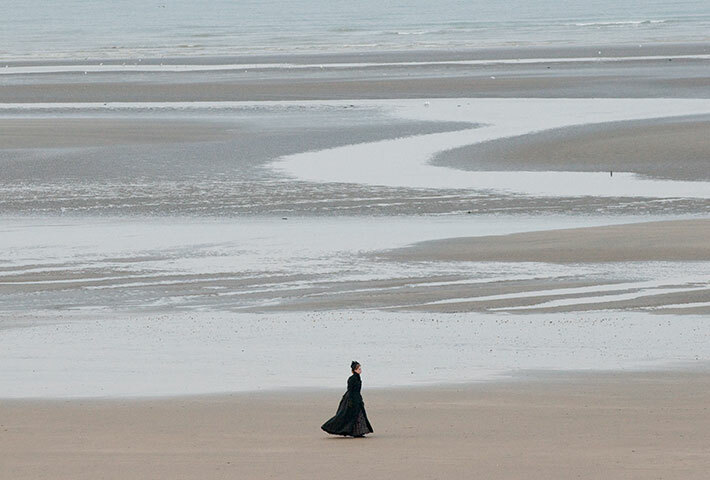 Shunning company and confidences, she paces feverishly along the beach, under a cool gray sky—for miles. She often appears distant or lost in reflection, even in the presence of others. The story is thus set in a mental landscape, inspired by the vastness of the ocean upon which Nelly frequently gazes. Sounds are stupefying as they serve to transition us in and out of reminiscences. Crashing waves, pounding hooves, and rustling petticoats come on forcefully and abruptly, suddenly immersing us in another place and time. Vertiginous camera angles function similarly; in one example, Nelly suffers a loss. Shaken with sobs, she falls to her knees—cut to an extreme low-angled shot of Mrs. Wharton-Robinson’s feet and the hemline of her skirts as she marches on the shore. The film’s epigraph, from A Tale of Two Cities, captures the argument: “A wonderful fact to reflect upon, that every human creature is constituted to be that profound secret and mystery to every other.” This insight into human nature becomes more melancholy and less profound when we remember that Nelly dreamt of breaking down the inner fortresses that separate us from one another, rendering men and women unfeeling and incomprehensible. Her own view was much more hopeful; in an early conversation with Charles, she proposes that an exception might be found in certain loving relationships. In sum, the film suggests that Nelly was not satisfied with the sublime, “so far refined love” (or her own sublimation), and she longed for a bit of that “dull, sublunary lovers’ love.” The story itself isn’t terribly compelling, and the treatment is inconsistent, but even still, the film is not wholly without merit. In particular, the punctured clichés and feminine perspective make The Invisible Woman worthy of further consideration. This entry was posted on January 15, 2014 at 3:43 am and is filed under FILM REVIEWS. You can follow any responses to this entry through the RSS 2.0 feed. You can leave a response, or trackback from your own site.